A novel, for me, is an excuse to pin down, collect, and put together all the little things about daily life that I like writing about. A novel is an excuse to, just like a museum, preserve the details, colors, tastes, social relationships, rituals, advertisements, smells, the chaotic richness and the sentiments that that richness lends us in the city. — Orhan Pamuk, "I Walk in the City All the Time": An Interview with Orhan Pamuk by Tobias Carroll, Hazlitt Magazine. It's a new year, baby! Starting now. It seems I've allowed my time to be swallowed by life, death, and facebook these last few months instead of blogging. I have, however, continued to read, though at a slower rate than in past years. I hate the feeling of not being able to organize my thoughts and set them down in this little piece of internet I call home (you know, at the house icon); I hate the feeling of not having the time to do so. 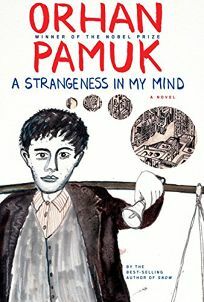 I have a few comments about A Strangeness in My Mind, the latest novel from Orhan Pamuk. I have not finished reading this book, but I want to. I had a digital review copy, which I let languish a little because life, but then I found myself taking train rides and having the luxury of long, uninterrupted blocks of time to read, and in this way I managed to read about two-thirds of this not so slender novel. One morning I was happily reading along. My layover gave me time to grab a coffee. Cozily settled into the connecting train, I opened up my e-reader to be greeted by an error — the rights had expired. there's a payoff. Frankly, most of what I'd read verged on boring; that is, it wasn't the novel I was expecting to read after the opening chapters describing an elopement. The next 400 pages cover the plight of the peasant coming to the big city to find his fortune, details regarding street vendors and the yogurt-selling trade, against a diachronic view of Istanbul. I was cut off in my reading just as the narrative was returning to that promised in the beginning, and Mevlut was, it seems to me, discovering religion. That is, just as it was getting interesting. I need to know if the last third of the novel, makes the first two-thirds relevant. How Istanbul has changed over the last several decades — culturally, socioeconomically, and politically — is actually interesting to me. But to my mind that story would've been better served in a separate collection of stories. I wanted to know more about how it was that, and what came to transpire when, Mevlut married the "wrong" girl. I'd read some blurbs to the effect that this was a feminist novel. After 400+ pages, I wouldn't say so, but I need to know if the remaining 200 pages make it so. The novel also makes use of a narrator-switching gimmick. That totally worked in My Name Is Red, but in Strangeness it's a distracting element. There's no regularity to it, or much reason for it beyond laziness to tell of events that couldn't otherwise be easily incorporated into a singular perspective; none of those secondary voices are much developed. Perhaps it works better in print where voices can be distinguished typographically. Also, what exactly is the strangeness in Mevlut's mind? Is it something to do with religion? I deliberately stayed away from reviews of this novel, so I could form an unbiased opinion. Let me pause a moment to check out some of those reviews now. Though at times it reads as a cross between a history manual and private memoir, A Strangeness in My Mind is above all a love letter to the city in all its faded, messy, dusty glory. Across the 600-odd pages of this epic fusion of soap opera, family saga and state-of-the-nation novel, Pamuk's beloved Istanbul mutates into that kind of skyscraping agglomeration: no longer a "familiar home" but "dreadful and dazzling at once". A Strangeness in My Mind becomes a tremendous concatenation of voices and places and politics and culture, gathered around a melancholy hero and a winding psychological plot. Mevlut, of course, is a model not of prevarication, but the awful capability of seeing the virtues in both sides. He likes the Communists because they care about the poor, and he likes the conservatives because a good man needs a break. He even likes the Islamists because their heritage should not be disparaged, and God, is after all, Great. He is not a weathercock, but an amalgam: it is possible to have all these beliefs at once, Pamuk suggests, and that complexity is in itself a good thing. I was unable to get my review copy extended, and when I first checked, by library didn't yet have it. I won't buy it, because I'm doubtful that the ending is worth it. My library has since acquired it, and I'm second in line for it now. So maybe my disappointment with A Strangeness in My Mind will coalesce into something more positive in a few months' time. Has anyone read A Strangeness in My Mind? Is it worth seeing through to the end? These are the other books I've finished reading since August, and I have every intention of writing more about them here. Zofloya; or, The Moor: A Romance of the fifteenth century, by Charlotte Dacre — which was not at all what I'd expected, omitting as it does "gothic" from its subtitle, which might have better prepared me for its hysterical revenge, bloodlust, and satanic qualities. Via Roma, by Mary Melfi — which was mostly forgettable, but portrayed both Montreal and Italian culture and so made for a nice comfort read after my Italian vacation this summer. A God in Ruins, by Kate Atkinson — which made me sob, several times, but the part about one minor character dying from brain cancer helped me deal with the fact of my brother's brain tumour. The Windup Girl, by Paolo Bacigalupi — which was difficult, but represents the kind of book I wish I were more fluent in reading. The Utopia of Rules, by David Graeber — which was somewhat cathartic amid the paperwork and complications I encountered in buying a condo and negotiating a mortgage. In the Kitchen, by Monica Ali — which made me hate dumb men for doing dumb things. So now the only things between me and my blog over the next six or seven weeks are travelling for the holidays, some shopping for furniture and appliances, packing up house, and navigating the other logistical nightmares of moving. Nothing I can't get through. Mrs. Todds my English teacher gives an automatic "F" if anyone ever writes "I woke up and it was all a dream" at the end of a story. She says it violates the deal between reader and writer; that it's a cop-out, it's the Boy Who Cried Wolf. But every single morning we really do wake up and it really was all a dream. — from Slade House, by David Mitchell. 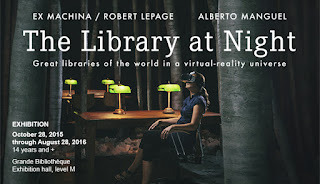 A virtual exploration of the great libraries of the world, inspired by Alberto Manguel's essay. 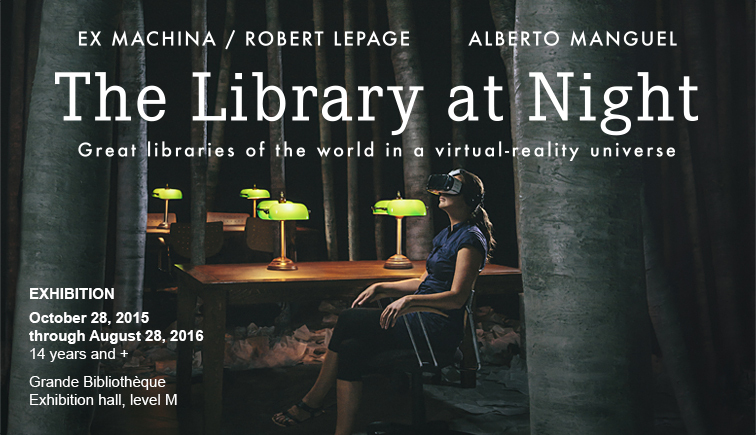 Step into a recreation of Manguel's own library. "The library in the morning suggests an echo of the severe and reasonably wishful order of the world, the library at night seems to rejoice in the world's essential, joyful muddle." Disclaimer: I've never played Fallout, but I've logged several hours watching other people play Fallout. In the latest installment, players can return overdue library books, strewn about the wasteland, for valuable tokens. "There's certainly no harm in including a library in an imagined dystopian future — if anything, it's a great reminder that overwhelming violence can destroy valuable culture and knowledge." A short film about the romance of books.